I’m putting my past into boxes. The clothes were the easiest. I’ve never had too many and they were all easily stuffed into my old duffel and my old dry bag to be put on the floor. The shirts with buttons will stay hanging for now. This packing up of all one’s possessions in an evening, to be left behind the next day, is an interesting exercise. I’ll be taking a backpack, and the clothes on my back, when I leave in the morning. A ferry to catch and a cross-country trek to discover. So I sit here with my past, passing in front of me, as I put it into piles and places. When I moved back to my hometown of Sechelt two years ago I fit everything into one car, including room to fit my brother into the car as well when I unexpectedly met him on the ferry. I got rid of the car a year ago. It takes me 15 minutes to walk across town. The vehicle was unnecessary. I will leave more behind. I’ve accumulated books the most. Plant identification, philosophy, literature, fiction, and even a not-for-resale preview copy of a mid-80’s sociology text book I found at the local Salvation Army. But I’m not attached to them. They’re going in boxes alongside everything else, and although I cast a wistful gaze at the books that got away, the ones I haven’t yet read, I know there are many books in the sea, and I’ll find one for me again soon. It is the way it works. The possession I value the most is the little photobook full of photos friends have sent me over the years, along with the collection of notes from former students and camp peers. I’ll be leaving the book of photos behind with family. And now, it is time to finish up for the night, and prepare for tomorrow’s start. Every start comes from an end and this night is finally here. A big transition about to happen in the closing of eyes, and an opening of them too. Good night and good bye Sechelt. Perhaps I’ll be back again in 6 or 7 months. Love the new site here, Jordan. 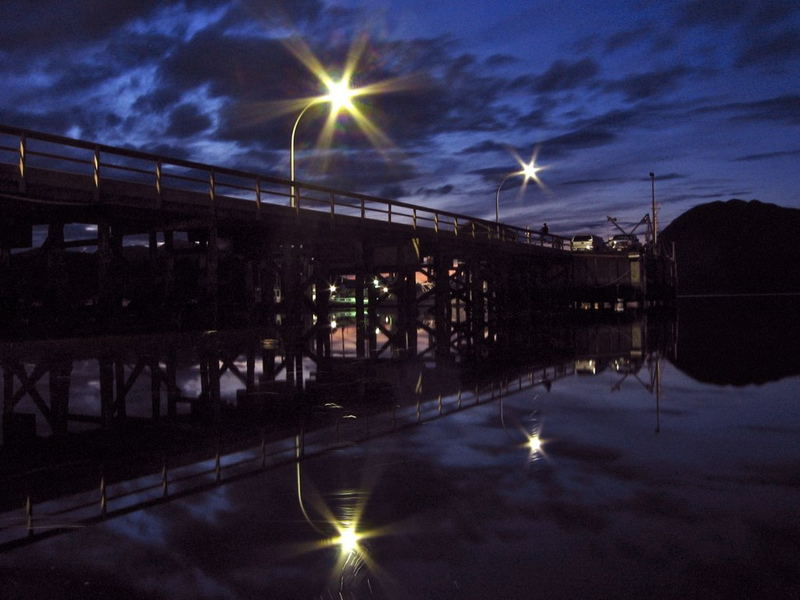 GREAT night shot of the pier here, and what a fun and inspirational piece to share with everyone! Best of luck, I hope we may have a chance to meet on your Island arm of your adventure! Be well… stay in touch.